The newest hot spot in town, Rue Saint-Marc, is a French American Bistro in San Marco. Across Hendricks Avenue from Matthew’s, this Medure-owned restaurant is essentially fine dining in a casual atmosphere. In a small building with its own parking lot you’ll find a gorgeously designed space with a truly open kitchen. Sit at the bar and watch the chefs skillfully create one fleeting masterpiece after another, or make new friends at the community table where you can still catch a view of the magic in the kitchen. There are only four booths at Rue Saint-Marc, along with one good sized table for larger parties. Other than that it’s patio, bar, or community seating. This lack of tables for nuclear parties is not so much an oversight as it is the whole point. Rue Saint-Marc is a place to stop in, gather with an old or new friend, and have community. It takes on the European concept of sharing a meal in lieu of going to a destination to eat. Rue Saint-Marc has been open for over a month now and they have quite a smooth operation. All four booths were full and it’s July so we chose to eat inside at the community table. Knowing we were writing a review and going to be trying many dishes, we passed on cocktails. The menu pricing was about 30% less than I expected with appetizers in the $8-$12 range and entrees in the high teens/low twenties. It made more sense when we got our food and the portion sizes were about 30% smaller than expected as well. This is in no way a criticism; you won’t leave hungry. It’s simply a choice the ownership has made. Offering excellently crafted French and French-inspired food in a way that more people can afford is certainly admirable and reflective of the overall feel and essence of Rue Saint-Marc. We started with three dishes from the appetizer menu: Pork Belly Rillons (with sweet garlic cream and muscadine grape glaze, $9), Rue Chopped Salad (seasonal vegetables and lettuces in Sherry vinaigrette, $7), and Cavatelli Pasta (in a saffron tomato sauce with ricotta, $11). 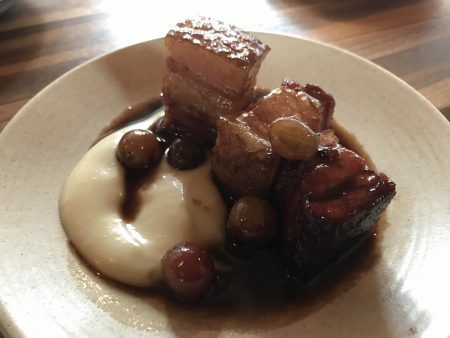 We tried the Pork Belly Rillons at the recommendation of our server and she did not steer us wrong. It came with three good sized pieces of pork belly. They are flash fried to help them hold together, but do not have a true fried taste. The muscadine grape glaze was deep and rich and sweet. More than just the sweet-salty combo, the pork belly and grape glaze were two unexpected dance partners for the taste buds. So good. The sweet garlic cream did not convey for us. Ours was bitter, not sweet. 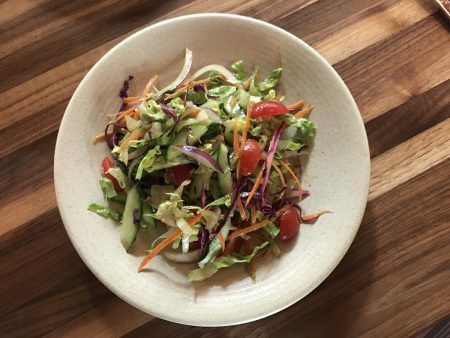 The Rue Chopped Salad was a desperate attempt on our part to have some vegetables in our lives. It was very simple, but fresh. I would absolutely order it again. 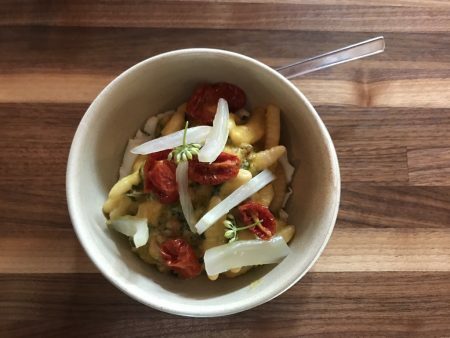 The Cavatelli Pasta was a real brain bender. The saffron tomato sauce is yellow and thick and makes your brain think “mac n cheese”. I actually had to look back at the menu because the visual of the dish did not match what I was expecting. It tastes like fresh pasta with a beautiful tomato sauce that happens to be saffron yellow. The ricotta is underneath the pasta, which gives you ample opportunity to scoop up bites of creamy goodness. 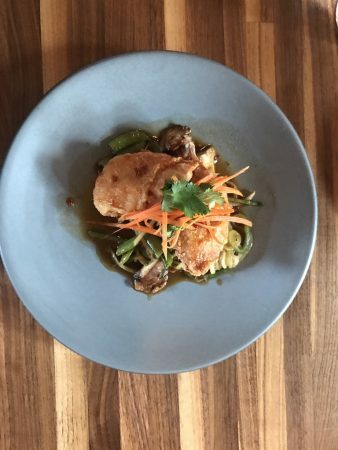 For our entrees we tried Local Fish Meunière (the fish that day was yellow snapper; in brown butter with chateau potatoes, $17) and Fried Cornish Hen (over cucumber “vermicelli” and soy roasted mushrooms, $19). The snapper was superb. This dish was simple and the food spoke for itself. Chateau potatoes are small-ish potato balls that are parboiled and then braised in butter. These little potatoes were adorable and delicious. 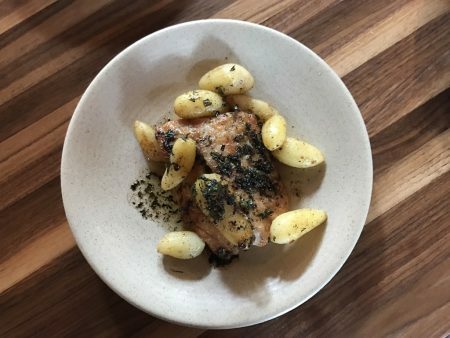 The chef finishes this dish by squeezing lemon over it, which is not mentioned on the menu. Be careful if you are not into lemon because this will not be the dish for you. The Cornish Hen was fried perfectly. It had red pepper, which gave it a kick and also a cumulative mild to medium spiciness as you ate it. The mushrooms, snap peas, and sauce under it were earthy. The cucumber “vermicelli” is a fancy version of “zoodles”. They came out nicely al dente and complemented the dish well. It’s worth noting that while we did not eat the Rue Cheeseburger (Gruyere cheese, marrow-onion jam, pickles, on a brioche bun with pommes frites, $13) a guy next to us at the community table did and it looked incredible. His had two burger patties and melty cheese on each patty between the bun. The pommes frites were made to order from actual sliced potatoes. We also ordered two ‘vegetables’. They were on the vegetable list, but they were dishes all their own. 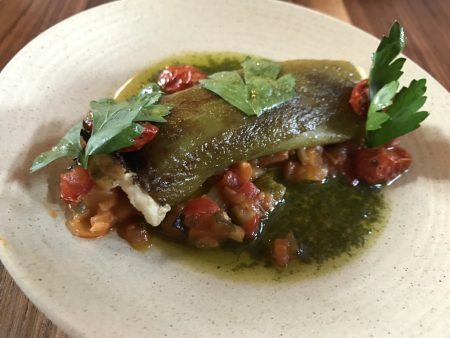 The Stuffed Cubanelle Pepper (ratatouille, basil pistou, $7) and the Eggplant Beignets (drizzled with orange blossom honey, sliced almonds, and goat’s cheese, $6) are great for sharing. Our server explained that the stuffed Cubanelle pepper now had Boursin cheese as well, which was not listed on the menu. The staff felt like it was missing something and played around with it and came up with adding Boursin cheese. This side is excellent and not spicy at all. The pepper has been roasted so it retains its flavor, but not its heat. The ratatouille and pesto are beautiful partners in this dish, and having eaten it with the Boursin cheese stuffed inside I can’t imagine it without. The eggplant beignets were the showstopper of our meal. 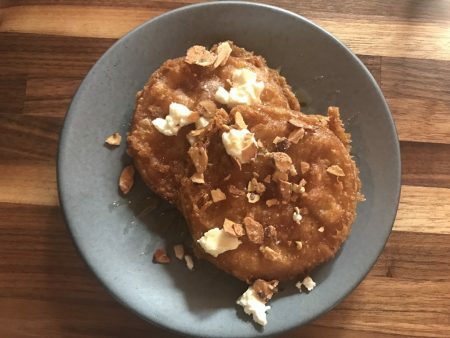 They are two large slices of eggplant, battered and fried, and topped with honey, almonds, and goat cheese to create a side dish that could honestly be a breakfast. Or a midnight snack. Or just perfect anytime. They are tender inside with sticky honey drizzled over top and just a sprinkling of crunchy almond slices. These eggplant beignets will speak to your soul. Whatever else you order at Rue Saint-Marc, get these beauties. The dessert case at Rue Saint-Marc is enticing, but we were fairly full. The lemon tart and creme brulee called to us, but we couldn’t respond. We tried two cookies and a macaron: Oatmeal Cream with Lavender Golden Raisins ($3.50), Confetti Cookie ($2), and Strawberry Macaron ($2). The oatmeal cream cookie looked like an oatmeal cream pie with two dark oatmeal cookies sandwiched with icing. The cookies themselves were rich and delicious, but we wanted more cream. The cookies are dense, so each bite just had a hint of cream with lots of cookie. It was still enjoyable, just not what we were hoping from the looks of it. 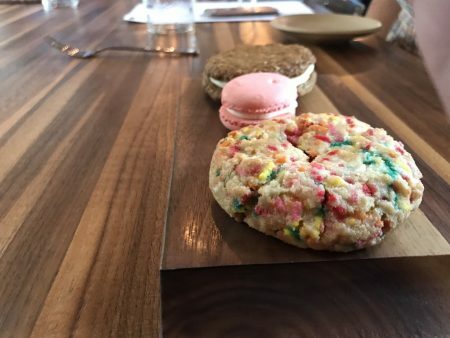 The confetti cookie stole the dessert show, of the things we tried. It was a heavy cookie with tons of butter, based on the spots it left on the dessert board. Worth it. These are not grocery store cookies. The macaron was quite good, better than most. The texture was right with a crisp outside and chewy inside. For the size of the restaurant, there is no shortage of people working at Rue Saint-Marc. It is all a smooth dance of taking orders, making orders, and delivering orders, but it is more than that. It is a celebration of food and friendship. Our server Natani was excellent; she knew the menu well and had killer recommendations. She was cool and calm and we were completely at ease. Rue Saint-Marc is the latest but certainly will not be the last restaurant concept from the M Hospitality Group. 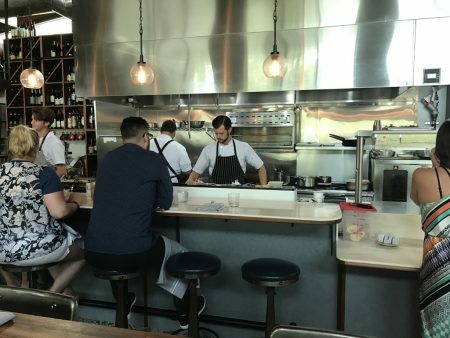 To quote my dining partner and founder of Jax Restaurant Reviews, after a string of mediocre meals lately, “It’s nice to go to a place that’s doing something interesting and actually can execute.” Santé! Tagged Alcohol Serving, american, Beer (Breweries and Restaurants), Brunch, Casual, Dessert, Dinner, Full Bar, Gluten-Free Friendly, International, lunch, outdoor seating, romantic, Serves Alcohol, tapas. Bookmark the permalink.